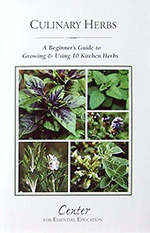 Culinary Herbs provides a guide for growing and using ten kitchen herbs. The information contained in this booklet is in calendar form to take you through all the seasons. The kit includes the booklet Culinary Herbs as well as the seeds for starting six kitchen herbs, including dill, fennel, parsley and thyme.